This is one of Daniel K. Wallingford’s two satirical maps putting certain U.S. citizens’ provincialism—and pretentiousness—on display. 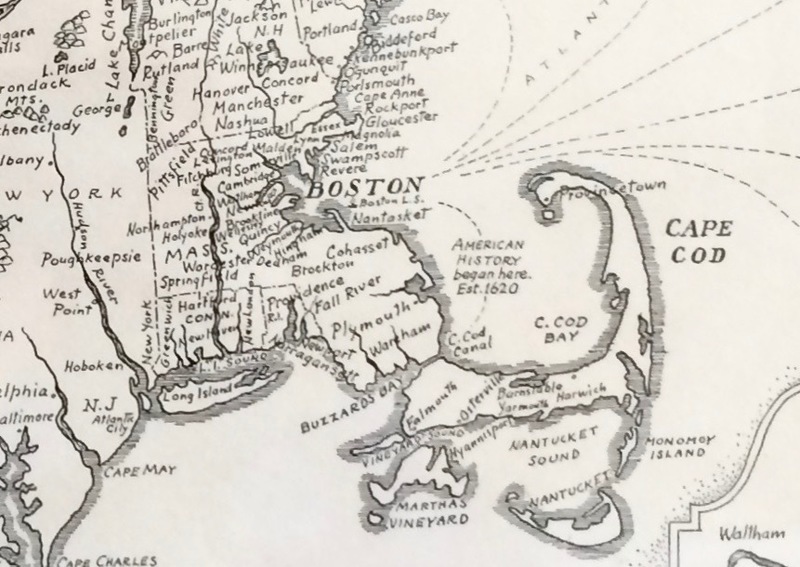 The Bostonian map and “A New Yorker’s Idea of the United States of America” were published by the Columbia University Press for the Times Book Fair in 1936, where they reportedly held strong appeal for fairgoers. New York City is described as a “nation within a NATION,” which makes sense when you notice how upstate New York makes up about one quarter of the country and Brooklyn dwarfs Florida. Meanwhile, California is displayed as three separate states, and “The Twin Cities” are situated in Michigan, and labeled as Minneapolis and Indianapolis. Wallingford was a native Bostonian, something very much evident in the detail and accuracy of his depiction of Boston and its environs. Any “Masshole” will immediately recognize the collection of towns which fall into the realm of Greater Boston, Cape Cod and the islands, and friendly neighbors Vermont and Maine. The real question, though, is whether “Massholes” relate to Wallingford’s erroneous portrayal of the rest of the nation. Wallingford’s maps came 15 years after a famous cartoon by John T. McCutcheon appeared in The Chicago Tribune. More a caricature than a map, it represents New England as the New Yorker’s schoolhouse, the Great Lakes as the “fish pond,” and Midwestern farmers as the “tenants.” McCutcheon’s “map” was also a precursor to Saul Steinberg’s famous 1976 New Yorker cover, “View of the World from 9th Avenue,” which spawned numerous spinoffs. By the late 1940s, the conceit had traveled west. Oren Arnold’s “Map of the United States as Californians See It,” from 1947, shows Los Angeles’ city limits stretching around the entire nation. In this map, California is named as the “capital of the universe,” and seems to be home to four of “the world’s finest harbors,” Lake Superior, “Lake Champagne,” and the Oregon Trail. Meanwhile, Florida is labeled as Death Valley and Swamp, Maine as “Friendly Republicans,” and down by the Gulf of Mexico you can spot South Dakota and South Cahlinuh. For a long time, maps were more about world view and control of empire than geographical accuracy. Wallingford’s tongue-in-cheek depictions of America illustrate how much a sense of place defines one’s perspective about what lies beyond, contributing to a collective and chronic myopia. After nearly a century, the humor of these maps still holds, which is somewhat unsettling—how after all the advancements in travel and information in this “global village” of ours, many city dwellers still don’t know the last thing about the rest of their country.